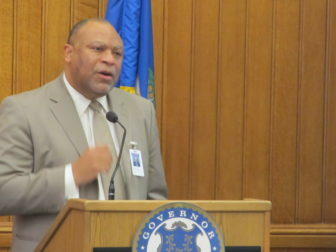 A group of Medicaid enrollees, providers and advocates demanded Thursday that the state Department of Social Services address the long wait times and dropped calls at its call center. The DSS system for handling clients’ calls has been under scrutiny since it was implemented five years ago to improve service. The old system relied on each client reaching a specific worker, who kept case information in paper files. 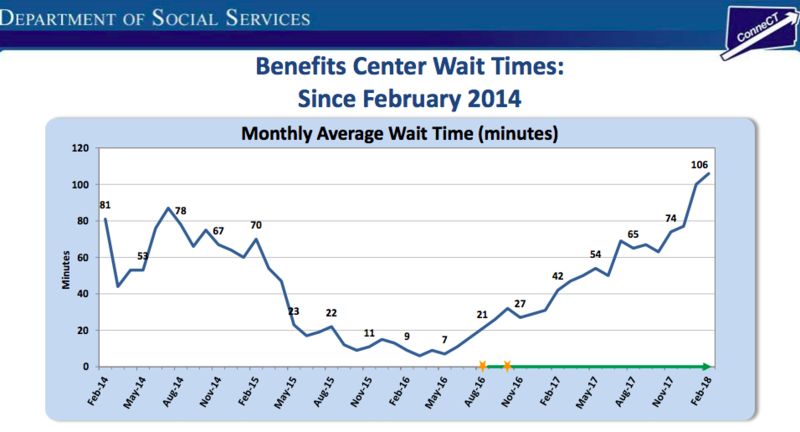 The wait times to reach a worker by phone have been inconsistent over the years. People call the center for help with health care coverage, food stamps and other public benefit programs. According to Thursday’s letter to DSS Commissioner Roderick Bremby outlining the group’s concerns, the average wait time this May was 96 minutes. In contrast, the period with the shortest wait times — 10 to 20 minutes — occurred between May 2015 and May 2016. “For many people with disabilities, they don’t have the option of going in person to stand in line for hours at one of the DSS regional offices, which means that their ONLY means for getting a problem fixed is the call center,” said Keith Mullinar, a Medicaid enrollee with muscular dystrophy, in a statement. Mullinar is a member of the CT Cross Disability Lifespan Alliance, a statewide coalition of more than 230 advocates, individuals and nonprofits. David Dearborn, DSS spokesman, said the agency is still reviewing the validity of the details provided in the letter. He highlighted some of the improvements DSS has made in recent years, and said the agency is working to bring the call wait times down through a variety of efforts, including the hiring of additional staff. SNAP is the federal food stamp program for low-income individuals and families. The 44 signatories, including Mullinar, called on DSS to produce a plan for getting to, and staying at, an average call wait time of 10 minutes or less. “We ask that you get back to us within two weeks with an express assurance to commit the necessary human and other resources to promptly reach and then maintain this standard. If not, we will explore all advocacy options to bring about the necessary changes,” the letter said. This chart was part of a presentation given by DSS in March. The letter gave several examples of state residents who waited for hours for help. On May 11, an elderly person called at 10 a.m. because her Medicare Savings Program benefits were denied due to DSS having erroneous income information. She gave up after waiting three hours. The letter said, as delays persisted, DSS claimed that replacing EMS with ImpaCT — the department’s computerized eligibility management system — would resolve the delays in processing and other DSS service issues.